Last night I thought it would be nice to try out that heart shaped nail polish idea from Pinterest on Paige and her little friend, Lexi. P.S. Thanks for letting me take a quick break! See you soon. Not sure, but I'm about 99% sure there's an answer to that somewhere on Pinterest! Oh no! I have no clue on that one... That is most unfortunate because that is a gorgeous skirt and looks MOST comfortable! I've used pure acetone to remove it from our rug, so I assume it would also work on safe fibers (the link says which ones would be ok). Hope you find something that works! Goo Gone, or Opps and sometimes the liquid Dryel works well. But usually the sooner the stain + application (of one of these) the better. Not to be weird but I have small (size of a dime) white crochet flowers, I'd be more than happy to drop one or 2 in the mail - that would at least cover it up and blend in. I have used 1 part dawn dish soap 3 parts hydrogen peroxide without issues. Maybe add a cute little lace flower or some other decorative item to cover the stain if nothing else works? I was also thinking like Sarah that you could add a few little felt, fabric, or lace flowers to cover it if all else fails! My daughter got hot pink nail polish on my white comforter and I got it out. I just kept soaking and scrubbing the spot in nail polish remover. I then soaked it in the washer with bleach and then hung it out in the sun! If the other methods don't work and if you don't mind losing a tier and making the skirt shorter, you could carefully rip out that section, and re-attach the bottom. Or create a new tier from some some similar eyelet to replace the damaged area. Cover it! Some sweet little embroidery stitches or a little patch will be perfect. Well, the skirt looks white in the picture, so you could try dotting it with bleach on a q-tip or fingernail polish remover. Or rubbing alcohol. If its not white i wouldn't try these things because they would only take the color out. I hope you find something that works!! Pure acetone! I hope you can save it, it's super cute! If nothing works dip dye it pink and try to go for an ombre effect. That would be totally on trend! Good luck! Wow, you guys have awesome ideas. Now I don't know what to try first! Thanks so much!! Sounds scary but trust me, works on my carpet. Put a fresh bit of nail polish over the stain then soak it up with a cotton pad soaked in nail polish remover. For some reason the pink nail varnish remover never works for this, it has to be the blue one, cant for the life remember the difference tho, I think one is asatone free or something. Hairspray! Just spray it on and dab it out. I got black nail polish on my white comforter. It took awhile, but it came out without damaging the fabric. sorry,ı don't speak english very well.but ı want to help you..you should try to delete your skirt with vinegar.or,you should go to a dry center..
maybe if you can't get it out, you could dye it? 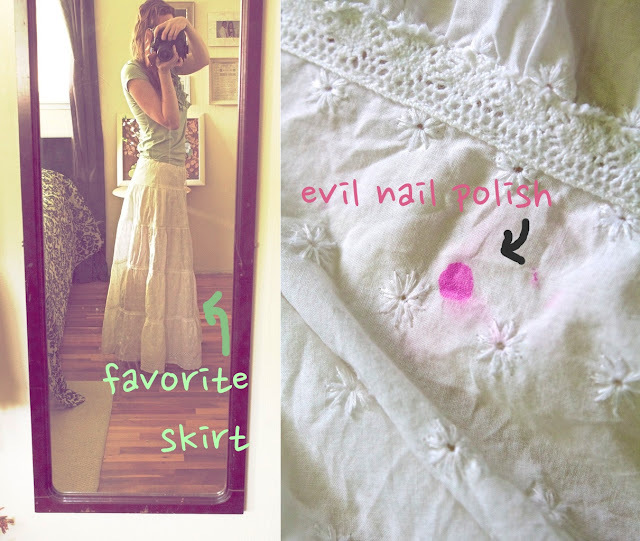 If you can't get it out, how about dye the whole skirt that color? I use gojo (http://www.gojo.com/) to get stains out of all clothes. I've gotten Sharpie out of a white shirt with it. Bunmmer! If you can't get it out, I'd just cut out a cute white applique and cover that sucker up. A heart or just a circle even with some wonder under or hem tape and then a cute embroidery stitch around the edges. You could put on a couple to make it not stand out so much even. Maybe you could dye the whole skirt a bright pink. Then the spot wouldn't be noticable. Windex followed by shaving cream and heavy scrubbing works like a charm to get it out of carpet. Maybe it would work for fabric too??? Hi This is what our cleaning Queen Shannon Lush in Australia recommends. "Put a cotton ball behind the stain then soak another cotton ball in acetone(not nail polish remover) and rub in a circular motion on the front of the stain. Use a dry cotton ball as a backing. Work from the outside to inside of the stain. Keep doing this until the stain is removed, replacing the cotton balls as you go. With some nail polish this process will need to be repeated up to 5 times"
I have used 100% acetone nail polish remover and it worked well. for stains that can't be removed on otherwise perfectly good clothing, I often embroider something over teh stain. I've also done reverse applique and actually cut the stain out! Pure acetone will work.... if a light pink shadow will resist then (after acetone is washed away and dried) put some pure clorine on it and wash it in the machine. I' ve saved a pure cashmere no laundry even tried to wash.
Love all the comments. Please tell us what you end up doing and how it works. i am really curious now. Bummer about the polish, I hate when that happens. I agree, nail polish remover. Goo gone is very greasy and you might not get THAT stain out. Try 'Grandma's Secret Spot Remover' or OxiClean if all else fails. It happened to me once, on my couch, and I really had to remove it before my parents could yell at me, so I put acetone on the spots, I rubbed it and then I put the entire couch cover in hot water, I let it soak for about ten - fifteen minutes, and finally I put it in my launder. And it worked perfectly ! Sew a tiny white yo-yo over it. Maybe it's a bad idea, but I've successfully used nail polish remover. I don't know how great that is for the fabric...but it's worked in the past. I had a permanent marker incident with a white shirt and it worked. And then a nail polish incident with a non-white shirt and it worked out. my two year old did the same thing to a white lace shirt last week. i tried tons of things...nothing worked. if something works, please share! My guess, maybe a bleach pen? Goof off? Or, as a last ditch effort, paint over the pink with white nail polish! Good luck! Don't think anyone has mentioned this one yet... bug spray! I have gotten nail polish on ALOT. I have always had success in SOAKING the spot in hydrogen proxide for 12-24 hours and then machine washing in cold water with a color fast sheet! If all else fails... permanent white paint marker. This may sound completely crazy but try a little lighter fluid! Then was it in the washing machine. What a pretty skirt! Don't laugh, but nail polish remover works to get ink and dyes of all kinds out of fabric. I once ruined a red shirt with nail polish remover (it did take the ink out... just also took the red dye! ), but your skirt is white so there won't be a problem! I spilled a whole bottle of polish on the carpet and I went to the hardware store and bought acetone and it took it right out. We have also used goof off (again from the hardware store) to get ink out and it works wonders. Regular acetone nailpolish didn't do anything to help get polish out. Try Fels-Naptha soap from the laundry aisle at the store. It's only like $1 for a huge bar that lasts forever. It got sharpie out of a brand new dress earlier this summer. I got polish out of a white shirt once with Lestoil. You can find it at Lowes. I vote for dye it w/ rit! i saw this on interest, don't know if you've seen it yet! I'm dying to know...what did you try? Did it work? Someone may have posted this already, but I saw this on interest this morning and it made e think of this post. I hope you get the polish out!